Annette Giacomazzi of CastCoverz! in Hollister featured in highly anticipated national book release. HOLLISTER, CA (March 31, 2014) – Annette d. Giacomazzi, owner of CastCoverz!, www.castcoverz.com, is pleased to announce her inclusion in the national release of The Mom Inventors Handbook; How to Turn Your Great Idea Into the Next Big Thing (Expanded Second Edition, McGraw Hill Publisher), by Tamara Monosoff, best-selling author and founder of Mom Inventors, Inc. This definitive guide for product entrepreneurs is jam-packed with step-by-step advice for taking an idea to market – covering the latest, most innovative ways to create, fund, market, distribute and sell. Having created a product solution and effectively taken it to market, Ms. Giacomazzi offers personal resources and true insider tips on how others can do the same. “The entrepreneurial experience is constantly evolving. With so many innovative resources and tools available today, I’m thrilled to share my story about developing and launching my business, CastCoverz!, and help others succeed through Tamara’s book, the revised and expanded 2nd edition of The Mom Inventors Handbook.” CastCoverz! manufactures covers for casts, braces, splints, and walking boots for orthopedic patients of all ages. CastCoverz! has 21 branded product lines, which include designer slings, crutches, and crutch pads, and is a top distributor for an additional 5 products. Thousands of entrepreneurs like Ms. Giacomazzi have successfully followed Monosoff’s advice to entrepreneurial success. Now, this expanded second edition includes updated information on product research and patent searches, crowdfunding, microloans, angel investors, in-depth coverage of video marketing, alternative sales channels like Groupon and Living Social, and much more. 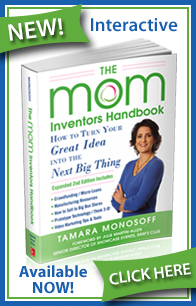 The Mom Inventors Handbook: How to Turn Your Great Idea into The Next Big Thing is available April 1, 2014 in stores and online wherever books are sold. To celebrate the launch of the book, readers can forward their book receipts to JourneyOn@TamaraMonosoff.com and they will receive a complimentary digital copy of The Ultimate Product Launch Companion Workbook for Entrepreneurs during the month of April. You can purchase a copy of the book through Amazon or Ms. Giacomazzi’s website, www.castcoverz.com. CastCoverz! is the leading global manufacturer, e-tailer and innovator of essential orthopedic soft goods (brace, splint, boot, and cast covers), patient-requested orthopedic gear and orthopedic accessories (crutches, CrutchWear®, EvenUp, waterproof products). CastCoverz! has been featured in Yahoo!, Wall Street Journal, Good Day Sacramento, Entrepreneur, Parenting Magazine, About.com, Huffington Post, Womenetics, NYTimes, Orthopedic This Week, and many more. In addition, CastCoverz! and its founder, Annette d. Giacomazzi, has been featured in two NYTimes and Amazon best-sellers, One Simple Idea for Start-Ups and Entrepreneurs, by Stephen Key and the The Mom Inventors Handbook, Revised and Expanded, 2nd Edition by Tamara Monosoff. CastCoverz! products ship world-wide and are available for purchase at select orthopedic clinics and www.castcoverz.com. Tamara Monosoff is Founder of Mom Invented®, a dynamic company with the mission to “Inspire, Inform & Boldly Promote Courageous Women in Business” and her step-by-step Power Mentoring Programs (offered at TamaraMonosoff.com are for anyone -- moms and non-moms alike) arm entrepreneurs with “real” tools and resources, helping them avoid costly mistakes, and teaching innovative ways to fund, produce and sell -- getting new products to market fast. Monosoff is the author of the best-selling books, The Mom Inventors Handbook: How to Turn Your Great Idea into the Next Big Thing (McGraw-Hill in 2005 first edition), Secrets of Millionaire Moms: Learn How They Turned Great Ideas into Booming Businesses--and How You Can Too! (McGraw-Hill in 2007), Your Million Dollar Dream: Regain Control & Be Your Own Boss (McGraw-Hill in 2010), and she co-authored, The One Page Business Plan for Women in Business (January 2010) and How Hot is Your Product? Find Out if Your Product Idea Will Make or Cost You Money! (2013). Tamara is an award winning inventor, social entrepreneur, educator and frequent speaker on Entrepreneurship and Women & Leadership. She is a former White House aide and holds a Masters (MA) and Doctorate Degree (Ed.D.) from the University of San Francisco, and a B.A. from the University of California at Santa Barbara. www.TamaraMonosoff.com. For more information or to schedule an interview, contact Annette d. Giacomazzi, annette@castcoverz.com, 831.636.3500.